Duffey Lake Road takes you from Whistler to the Okanagan Valley, with natural beauty along the way. 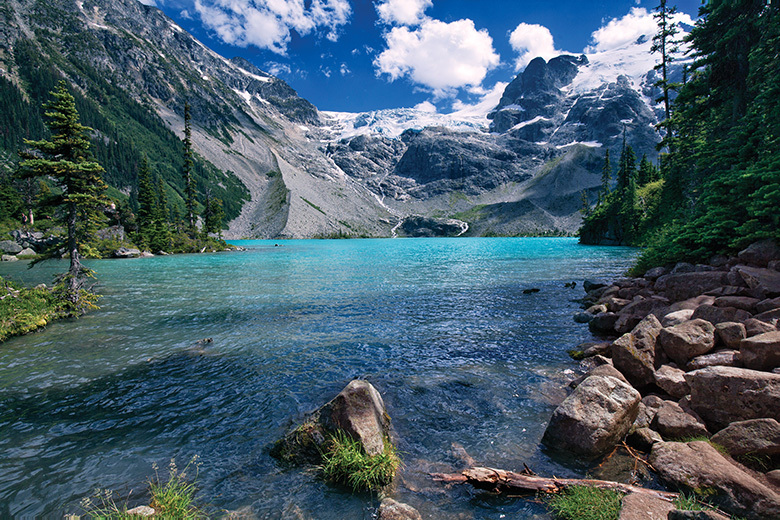 Get an eyeful of Matier Glacier from Joffre Lake. The story goes that on any road trip, my grandfather always insisted on driving 100 miles before breakfast. As a child, the idea terrified me; but now, with coffee as a crutch, I’m happy to leave Seattle with just a snack and save my appetite for Richmond, British Columbia, about 135 miles north. That’s why, as my husband and I started on an 840-mile road trip, our first stop is at Golden Sichuan Restaurant for boiled beef with chiles, breakfast foods be damned. It fuels us for the next leg of our journey: the breathtaking drive up Howe Sound. During that first stretch of winding road between Vancouver and Whistler, known as the Sea to Sky Highway, our eyes strain to adjust to the beauty: Glistening waters cut between the coastal hills as they build to inland mountains, impressively snowcapped even in the warmest months. We’ve planned a trip over the colloquially named Duffey Lake Road (otherwise known as British Columbia Highway 99). This mountainous route takes travelers from Whistler to British Columbia’s Okanagan Valley, where the province’s most famous wine region is located, and then home through central Washington. The first day, Whistler warms us up for vacation mode. After a quick hike under the ski resort’s chairlifts, we check into a new Alpine Suite at the Fairmont Chateau Whistler. From our ninth-floor perch, we can almost see where, earlier, we had spotted the curious mama bear that inspired us to spend the evening at Bar Oso (“oso” is Spanish for “bear”), the new onyx-lined tapas bar from the culinary minds behind Whistler’s famous Araxi restaurant. Over an extensive gin and cocktail menu, and soft, freshly cut Ibérico ham, we consider the bear, and the next day’s long drive on Highway 99. Photograph by Lionel Trudel. Views of Canada’s Okanagan Valley roll out in front of visitors to Liquidity Wines. Leaving Whistler, we drive north about 30 miles to its de facto employee town, Pemberton, which has blossomed as the resort has grown (best coffee: Mount Currie Coffee Co.). Almost immediately, the traffic thins to a trickle, and we wind through Pemberton’s rich farmland, past a few crumbling gas stations and Lillooet Lake, then give up civilization altogether and climb higher into the Coast Mountain Range, where glacier-packed peaks begin lumbering skyward. The 212-mile stretch between Duffey Lake itself (be sure to stop at the lake to look backward toward Whistler) and Kelowna is a staggering display of B.C.’s geological diversity, but until recently was devoid of any essential stops. The 2015 launch of the tasting room and restaurant at Fort Berens Estate Winery, about 30 miles past Duffey Lake, has changed that. However, if you stop here, you’ll have to decide who gets wine with their burger at lunch and who has to wait a few more hours for The Terrace Restaurant at Mission Hill Winery in West Kelowna. I lucked out; sitting in the passenger seat after lunch, I gazed dreamily out the window as the landscape morphed from mountainous desert to river basin and then to the arid hills that Highway 97—which traverses more than 1,200 miles in British Columbia—calls home. From an urbanite’s standpoint, the highway is remarkably empty, but it’s precisely that emptiness that leads us back to this road year after year, as if the physical act of driving up and over the mountains and through the desert can incite in us the ability to get over the hills and dry spells in our own lives. Three and a half hours later, we stop to stretch, eat dinner and drink wine at Mission Hill, whose tall, stately bell tower overlooks the region once generally known as the Okanagan Mission. Strolling through pedestrian-only Whistler Village. Mission Hill, the long-reigning queen of the Okanagan wine scene, is one of the few Okanagan wineries whose bottles are consistently available in the states; however, bottles from CheckMate, the new premium winery owned by Mission Hill’s proprietor which uses the winery’s best Chardonnay and Merlot grapes, are much harder to get. That’s why we paired the restaurant’s creative takes on upscale wine-country cuisine (think charcoal sourdough, and fois gras and ham hock terrine) with flights of CheckMate’s various Chardonnays. We’ve all heard the adage about the journey being more important than the destination, but as we settled into cups of hot coffee on the patio after dinner, watching Okanagan Lake sparkle in the sun’s last rays, we weren’t sure we should have to choose between the two. On our third day, after a night overlooking the water at Kelowna’s Hotel Eldorado, sipping Seattle-worthy coffee at Bean Scene and enjoying eggs Benedicts at Summerhill Pyramid Winery, we wound our way down the 105-mile-long Okanagan Valley, stopping to eat and taste wine: first, arctic char gravlax tartines and Viognier in the ever-changing gallery at Liquidity Wines; then, charcuterie and a vineyard tour at Covert Farms, an almost 700-acre winery and produce farm that sits right at the point where the ice dam that broke to create the valley 10,000 years ago once stood. We bought half a case of rosé at Bartier Bros.—it tasted more like a mineral-forward southern Italian rosé than anything I’ve had on this continent—and finally checked into a room at the Watermark Beach Resort on the shore of Osoyoos Lake before slumping on the beach, exhausted by wine and sun. At dawn, we took stand-up paddleboards just far enough across Osoyoos Lake to feel like we’d exercised, tallied up our wine purchases—just short of two cases—and smiled as a customs agent waved us across the border without charging us duty on the wine. The Sea to Sky Highway, between Vancouver and Whistler, hugs spectacular Howe Sound. We cruised down Washington’s Okanogan (note the U.S. spelling) Valley, which, although born from the same glacial history, feels like it missed the agricultural jackpot its northern relative is so clearly enjoying. There are cherries and apples and ranchland, but no grapes to be seen, and certainly no tourism industry. Still, it’s beautiful, I think as the miles fly by and my stomach grumbles. Ending as we began, we’re putting in those early-morning miles, waiting for fresh croissant-dough cinnamon rolls at Cashmere’s Anjou Bakery. Like so many things a road trip brings, they’re worth the wait. Roadtrip through B.C. with this whimsical Canada-themed playlist.